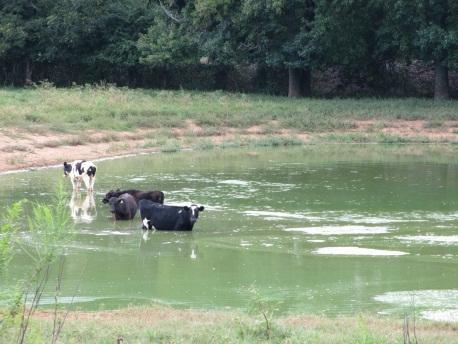 Excessive nutrient enrichment in watersheds can create harmful algal blooms (HABs) in aquatic systems, including ponds, which are frequently used to water livestock. Harmful algal blooms are typically dominated by cyanobacteria (commonly referred to as “blue green algae”) many of which produce toxins that can be harmful to fish, wildlife and humans. In May 2012, our laboratory began receiving reports of cattle mortalities associated with HABs. We began an outreach effort to screen and identify algal species and toxins in water samples submitted by private citizens from ponds throughtout Georgia. Prior to this effort, no state or federal laboratories offered such a service. Private laboratories conduct these services, however the collection protocols and analytical costs preclude the average citizen from utilizing them. Rapid detetion of a HAB is critical for farmers so that access to the water source can be restricted. We recognized the need to provide such a service and to educate the public regarding exposure effects, preventative measures, and treatment of HABs. During Summer 2012 sampling events we commonly encountered Microcystis blooms in both farm ponds used by humans for fishing and recreation (above) and for watering livestock (below). We documented dense blooms of planktonic cyanobacteria, predominantly Microcystis aeruginosa, and extremely high levels of the potent hepatotoxin, Microcystin, in water samples submitted by Georgia cattle producers (Haynie et al. 2013). Many of these samples were submitted by producers who had experienced cattle mortalities, potentially due to algal toxin exposure. Through a collaborative effort with UGA’s Agriculture and Environmental Services Laboratories, we established a water screening service that includes algal speciation and toxin detection. This service became available to the public in Februrary 2013. This effort included a detailed outreach letter to extension agents, sampling protocol and materials for water sample collection and shipping. This screening service is avalible for either a $30.00 (algal identification) or $45.00 (toxin analysis and algal identification) fee. The submitter will receive an electronic report within 24 hours with results, interpretation, and recommendations. We have begun promoting this service and educating the public about HABs by participating in various short courses, meetings and outreach opportunities. We have demonstrated that HABs and cyanotoxins are common in Georgia agriculture ponds. Therefore, the potential for livestock exposure and subsequent effects including mortality are likely to occur. Education and establishment of a rapid toxin detection service is warranted and will be beneficial to producers. The livestock deaths have highlighted an important issue for Georgia farmers and pond owners that will likely be increasingly prevalent under projected climatic models. We will continue our outreach efforts by participating in University and industry sponsored workshops and meetings. We will use these opportunities to educate and inform the public about the newly available algal screening service. We have included, in recently submitted grants, funding to subsidize testing expenses in order to encourage more farmers/pond owners to use this service. We intend to utilize the testing service to gather spatially referenced data on the prevalence of HABs and toxin levels in GA ponds. This information, which is not currently available, will inform nutrient management plans and BMPs that will ultimately improve nutrient management and water resources in Georgia. We hope that this effort will serve as a model for other states experiencing similar increases in frequency and severity of HABs in agricultural settings. Haynie, R. S., J. R. Morgan, B. Bartelme, B. Willis, J. H. Rodgers Jr., A.L. Jones and S. B. Wilde. 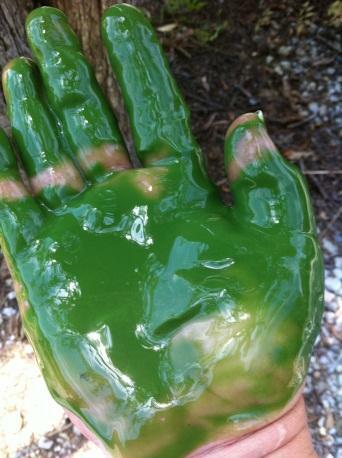 Harmful algal blooms and toxin production in Georgia ponds. (in review). Proceedings of the Georgia Water Resources Conference. Athens, Georgia. April 2013. Burtle, G.J. July 2012. Managing Algal Blooms and the Potential for Algal Toxins in Pond Water. University of Georgia Cooperative Extension Temporary Publication 101. Haynie, R.S., J.R. Morgan, B. Bartelme, S. B. Wilde. Cyanotoxins: Exposure Effects and Mangagement Options. Proceedings of the UGA Extension Beef Cattle Shortcourse. Ed. L. Stewart. Athens, Georgia. January 2013. Drs. Lawton Stewart, Gary Burtle (Animal and Dairy Science, College of Agriculture and Environmental Sciences, UGA) coordinated sample delivery from pond owners to our laboratory. Brad Bartelme, James Herrin and Jamie Morgan (Warnell School of Forestry and Natural Resources, UGA) contributed significant technical assistance with algal screening and sample processing.